Chinchillas are native to Chile and Peru. In the wild they live in groups and make their home in burrows and natural outcroppings and crevices. These small, cute rodents have plush, soft coats of fur. They weigh around 1 to 1.5 pounds and can be up to a foot long. They have rounded ears and eyes on either side of a broad head. Their fur is very dense, soft, and pleasant to touch. The fur is often gray, but can be beige, tan, black or white. These beautiful rodents can live as long as 20 years. Chinchillas can make wonderful pets for the right family. They are smart, inquisitive, and loving animals. They are active, vocal, and entertaining to watch. Since they can live up to 20 years they can be long time companions. They are not recommended for young children. Children are often overzealous with affection and could frighten or injure a chinchilla. A chinchilla could possibly bite a child out of fear. Although loving animals, they do require gentle and careful handling. These adorable creatures are social animals and need a lot of interaction. A lone chinchilla requires a great deal of attention and can become very attached to its owner. If you are unable to devote that much time to your pet, it is better to have two chinchillas than one lonely unhappy pet. Two chinchillas can play and interact and not be completely dependent on their owner. Information on the supplies necessary to care for your pet. The food, diet, and nutritional requirements of your pet. Everything needed to have a safe and entertaining home. 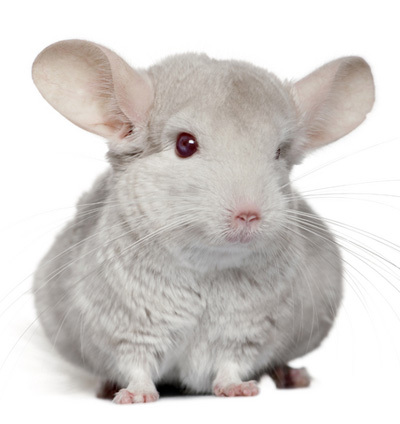 Common health problems and illnesses that could affect your chinchilla. All about breeding and chinchilla babies.